Make the pastry as far in advance as is possible and leave to rest, preferably overnight. You could also make the frangipane for the filling in advance – both will keep remarkably well in the fridge for several days. I’ve added apricots here – they go so well with the almonds – but you can use other stone fruit such as peaches or plums. Serve it with a jug of good, thick Jersey cream, if desired. To make the pastry, cut the butter into small pieces and add to the flour in a bowl, along with a pinch of salt. Deftly work this with your fingertips until a fine crumb is achieved (the faint-hearted can, of course, use a food processor). Stir in the sugar, add the egg and gently knead until smooth. Roll into a ball and flatten lightly, wrap in clingfilm and refrigerate for at least 30 minutes, but preferably longer. Roll out the pastry on a lightly floured, cool surface to a thickness of no more than 5mm. Use it to line a fluted tart case with removable base with a diameter of 25.5cm and depth of 2.5cm. Chill the tart base in the fridge for at least an hour prior to cooking. Preheat the oven to 170˚C/gas 3. To make the frangipane, grind the almonds to a fine powder in a food processor and set aside. Whiz the sugar and butter, until light and fluffy, then gradually add the eggs with the motor running. Mix in the ground almonds. Heap the frangipane into the tart and gently press down. 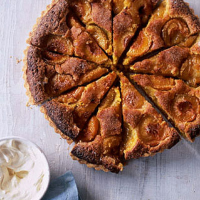 Place the apricots on the frangipane, cut-sides up, and dust with a little caster sugar. Place in the middle of the oven and bake for about 1 hour 30 minutes, until golden and set. Cool on a wire rack before serving. If you are after a sweet treat to go with this gorgeous dessert, there is nothing better than this vin santo. It has a nutty edge and also enough acidity to balance out the fruit. Crociani 1999 Vin Santo di Montepulciano, Italy. Bin 56682.